Unlike responsive typography, which changes only at set breakpoints, fluid typography resizes smoothly to match any device width. It is an intuitive option for a web in which we have a practically infinite number of screen sizes to support. Yet, for some reason, it is still used far less than responsive techniques. Viewport units are what make fluid typography on the web possible. Viewport units refer to a percentage of the browser’s viewport dimensions. For example, 1 viewport width (vw) is equal to 1% of the viewport’s width. The units differ from percentages because they are always relative to the viewport, whereas a percentage is relative to the element’s parent container. Using viewport-relative units alone comes with some drawbacks. 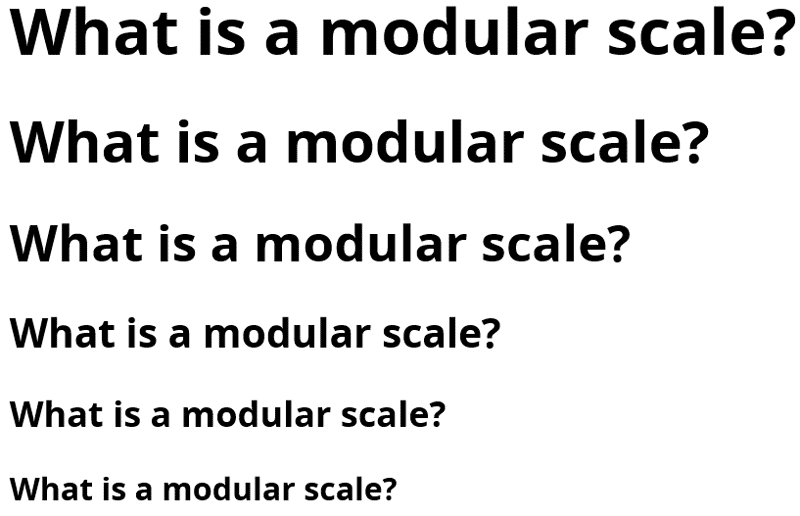 We don’t get precise control over the rate of scale; we don’t have min or max font sizes; and, just like pixels, a declaration might override the user’s font-size preferences. Luckily, there are ways to overcome all of these limitations. Because we want to use em units for our media queries, let’s convert the pixels to ems. We’ll divide 800 by 16 (or whatever the root em is equal to in pixels): 800 ÷ 16 = 50. If you find it easier, we could do the calculation in ems: 1 ÷ (2 ÷ 100) = 50. As you can see in the example above, by setting a font size of 2vw and a breakpoint of 50em, we get a seamless transition between the fixed and fluid values. We can use the same calculation to work out a maximum font size. If we wanted a maximum font size of 24 pixels, we could calculate like so: 24 ÷ (2 ÷ 100) = 1200px. In ems, that would be: 1.5 ÷ (2 ÷ 100) = 75. Then, above 75 ems, we would reset the font size to a fixed value. How do we get around these limitations? The answer is to use calc(). Using calc() and viewport units together, we can get advanced fluid typography that scales perfectly between specific pixel values within a specific viewport range. We simply need to create a basic mathematical function. 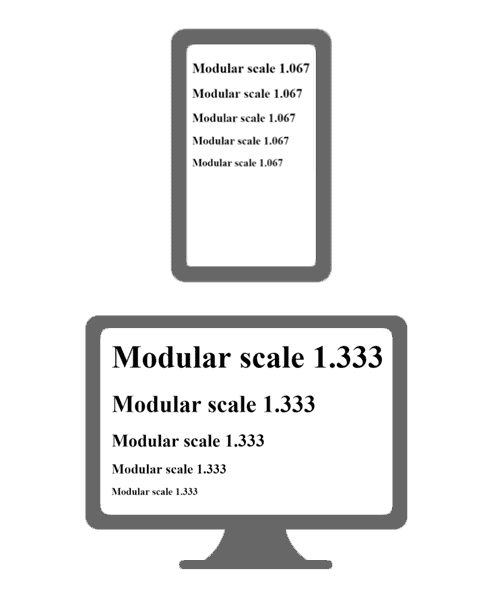 On a small screen, heading sizes should be more uniform; a large screen has room for greater variation. We can use the typographic techniques described above to fluidly transition between different modular scales. 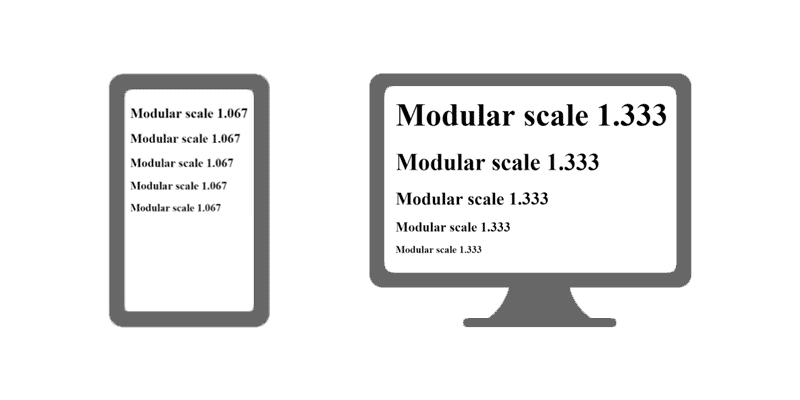 Simply pick a ratio for small screens and a different ratio for large screens, and then work out the minimum and maximum font sizes for each heading level. For heading elements, I want a different line height. However, I want the height of the line plus the margins to equal an increment of the baseline. This is where calc() helps. In this example, the total height of the heading element plus the margins will be 3rem, which is exactly twice the value of our baseline. This was an unexpected benefit, and in many places we ditched the design treatment for tablets because the desktop presentation now worked on smaller screens. 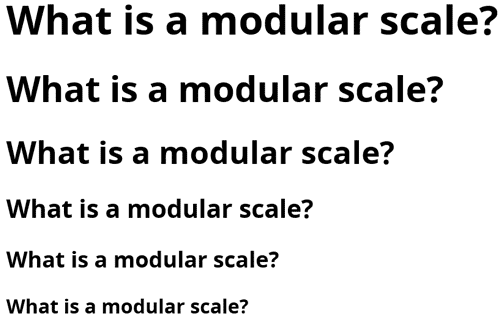 I had to accept that, because the main container does not scale at the same rate as the text, some text would inevitably reflow when the browser is resized. This was a concern only because I did not want readers to lose their place when changing the device’s orientation. Because we could not avoid this, the only thing we could do was to test the impact on certain devices. With the choices we made, luckily the reflowing was hardly noticeable on mobile devices, and even on large tablets the impact was minimal. I often hear that Safari, and mobile Safari in particular, has significant bugs with both viewport units and calc() expressions. However, more often than not, specific problems are not mentioned, so I thought I would do my own testing. If the entire design is going to be fluid, then you will probably want to consider making the root em fluid, by declaring a font size with a fluid unit on the html element. You can then use em and rem units throughout the rest of the design.